If there’s one shoe that I’ve bloomin’ loved this year, it’s the good old flatform sandal. Yes, they may be a total risk to walk in and could result in a twisted ankle, but they look cute, right? I remember back in the day when flatforms were the ultimate statement style piece. I wasn’t quite comfortable with my style back then and never ventured into them. I’m yet to own a closed-toe pair of flatforms (although I’m totally eyeing those thick sole converse and vans), and if like me you’re not too sure of them just yet, sandals are the perfect alternative. These beauties are from Matalan – I love the satin details! 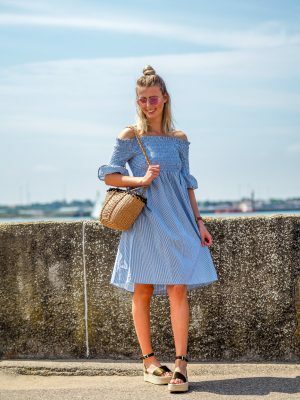 For me, flatforms will go with pretty much everything, but my favourite way to style it is with a flowy dress like this one. 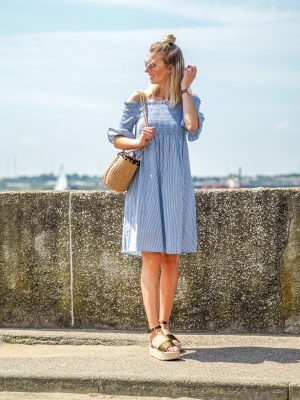 We all know I’m a lover of stripes, and this bardot dress is definitely going to be getting plenty of wear this Summer. 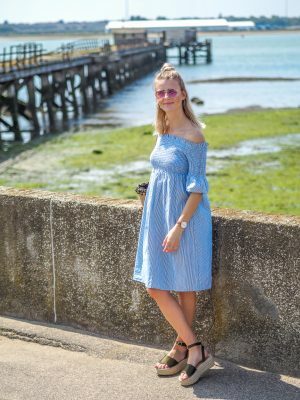 There’s nothing better than a simple and minimal outfit, especially when it comes to summer heat, you don’t want to be faffing around in lots of material. Another total winner for this dress is how much room it leaves for a food baby. Just look at it!! There’s nothing worse than going out and being in a tight-skin dress and worrying about being bloated. This dress will be worn for every bbq I’ll be attending this Summer. 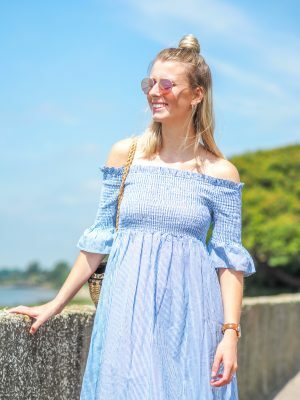 Want to shop similar? I’ve got you! 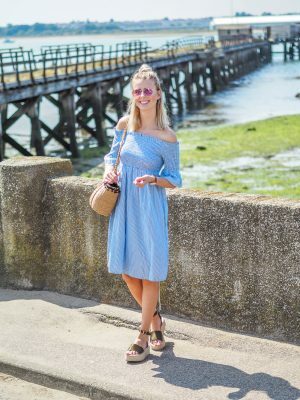 "Tackling hay fever this Summer with Vision Direct"